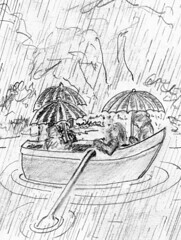 Although last Friday’s waterborne open mic event was dogged by persistent rain from start to finish, the organisers – aided by the predictions of a friendly meteorologist – had fortunately possesed the foresight to build a shelter using a large tarpaulin in the woods by the river Cherwell. Some of the participants got quite wet travelling on punts from Cherwell Boathouse to Mesopotamia (a narrow island between two levels of the river, that runs from the University Parks to Marston Road). A second contingent made their way by rowing boat from a jetty near Folly Bridge, upstream to the Flotilla Thrilla rendevous point. Despite poor visibility, the two parties were able to identify each other and exchanged greetings, including blasts from a small horn. Unfortunately the light was too low to get a photo of the rowing crew at the point they encountered the punts. Here is a pencil sketch rendered from memory instead. The boats were unloaded and a fire was built under the tarpaulin, allowing everyone to dry off and keep warm. With the two principal problem – shelter and heat &ndash solved, Moogieman kicked off the evening with a song about punting. Performances continued late into the night, with plenty of vocal and hand percussion accompaniment. A new song was even composed in situ by some of the revellers, and given a rousing rendition with most of those present taking part. 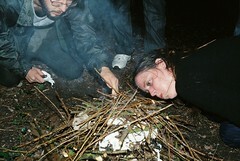 Dave Shakespeare and Cath Brown getting the fire going. Unfortunately, due to the weather, there wasn’t really an opportunity for recitals on board the boats themselves. We fully intend to attempt a second Flotilla Thrilla later in the year when we can hopefully expect less damp, if not necessarily fine, weather. Photos were taken with an Olympus Trip 35 (a 1980 zone-focus camera) using Fuji Superia Xtra 400. 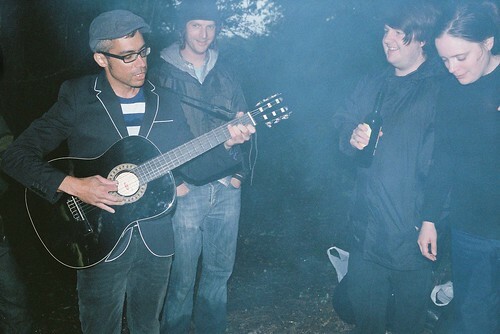 This entry was posted on 29 June 2011 at 9:20 pm	and is filed under Gig, Olympus Trip, Open mic, Punting, Weather. You can follow any responses to this entry through the RSS 2.0 feed. Both comments and pings are currently closed.